I am to do. These usually come from the design department of a company, so who am I to tell the designer that I don't think much of his plans? The second type is when someone brings in an existing component, either from an antique piece of furniture or from a job that someone else has made. With this type of job, once again there is little question of what I am to make. If I decide to 'make improvements' it will most likely come back to me with the comment, "Please make what we asked for." The third type is a little more vague and offers rather more scope for me to have some input into the design. A customer will come in with a very rough sketch of what he wants, what we used to call 'fag packet joinery' because often the only bit of paper handy on site was the inside of a cigarette packet. Last month seemed to be all about design and I had at least one of each of these jobs, as well as my usual mix of turning. The first of these design based jobs was sent from a local furniture company. They needed eight table legs making in American tulip (Liriodendron tulipifera), which they supplied, to a drawing sent from their designer. I suppose you could say it is a modern or contemporary design, all smooth flowing lines and a painted finish. I am perhaps a little more old fashioned with my designs and would have liked to have added a few fillets, just to break it up a bit and give some definition. I find this sort of design a little wishy washy. Not only that, but a design like this is actually harder to make as there are very few natural places to make sizing cuts, whereas, when there are fillets you can use these to regulate the dimensions. Once I had made the first and worked out the best way to turn them and get them all the same, I got much quicker. 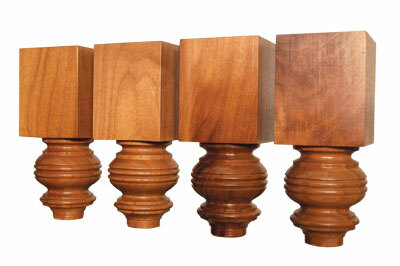 In the end the job went well and I was able to call the customer to collect the finished legs. 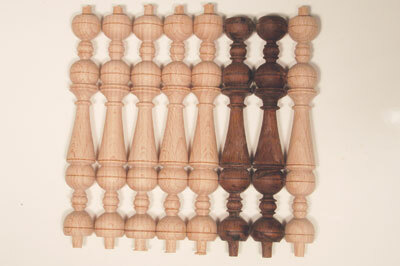 You may remember a couple of months ago, I made a whole range of tiny parts for some middle eastern antique chairs. When the guy collected them he mentioned that there would be a few more components to make and sure enough, he sent them through to me. Not so many this time, thankfully. 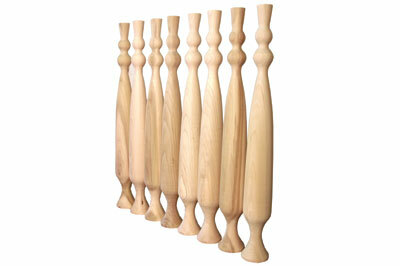 Just six small beech (Fagus sylvatica) spindles, to match the originals. As I mentioned before, when you have an original to copy you know exactly what you have to make and there is no real excuse not to do so. I find some of these antique parts to be rather busy and full of tiny details, all of which need replicating. These spindles were just 150mm (6in) long and 18mm diameter and I think turned out well; the customer certainly seemed pleased. One thing that made me smile was that, if you look closely on the ball sections of one of the originals, you see the signs of a skew catch. It seems even craftsmen back then had catches! I find that I design best within set guidelines. Designing from scratch is a tough job, but given some parameters I feel much more comfortable. This was the case last month when a local joiner called in and asked if I could turn some corner posts for bunk beds he was making for his sons. He came in with the timber and a tiny picture he had printed from the internet. On the timber he had marked where the various rails were to be tenoned in and where he wanted the turned parts to be. They needed a turned section in the centre and a kind of bun foot. They were made of 100 x 100mm softwood and around 5ft long. He was pretty vague as to the exact design but while showing him some of my other work, he spotted a section on the base of a stair spindle I had made and said that he liked that. I told him I was sure I could stretch the design and scale it up to suit his job. So I had the shape, I just had to proportion it to suit the job. I first did a full-sized drawing of half of the spindle as my copy template, I wrote on the dimensions which seemed about right and went to work. 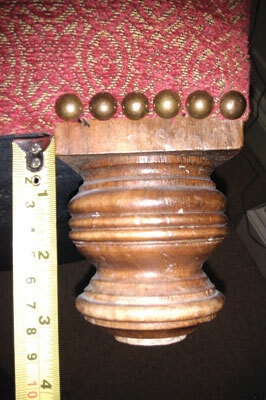 As I worked I adjusted the measurements until I thought they looked right on the actual spindle. Once I was happy with the first I could carry on with the other three. 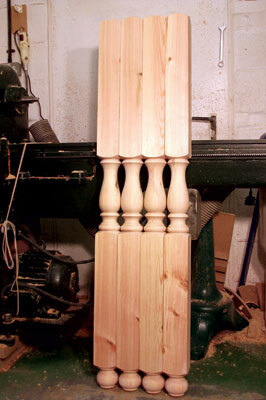 The customer was pleased with the result and now needs some smaller spindles turning for the side of the top bunk; I will once again use the same design of spindle but it will need re-proportioning to suit a 30mm spindle of around 350mm long. This is the sort of challenge that I really enjoy and it adds another dimension to my turning. Pilasters are often used in posh kitchens as part of the base units and are designed to look like they are supporting the worktops. Sometimes they are designed to look a little like Roman or Greek columns but this customer was rather less specific. The information I got from him initially was that he wanted a central bead detail and the design to be symmetrical; it should also look quite heavy and strong to give the impression that it was sturdy and doing its supposed job of supporting the worktop. Over the last few years I have collected a number of books with different designs in them, one of the best for my type of work is called Classic Forms by Stuart E Dyas. It is full of sketches and photos of everything from spindles to finials and columns to fountains. I found an appropriate double page of designs and showed him. I pointed out a rather elegant design I thought would suit best; he said he liked it but that it should be a bit chunkier, "More like that one," he said, pointing to the ugliest spindle on the page. My heart sank a little and I said, "No problem," which I feel has become something of a catchphrase of mine. Back in the workshop with the 100mm thick oak (Quercus robur) he had given me I set to work. I decided I would compromise and turn a design more like the one I had pointed out, but make it chunkier to better suit the brief. 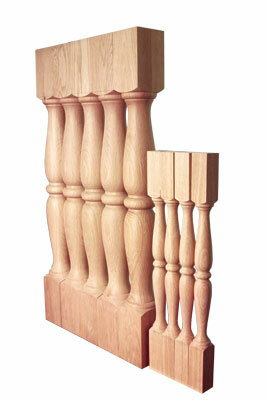 There were five pilasters to turn and another four smaller spindles for use in another part of the same kitchen. Once again I had to re-proportion the design to a smaller and much thinner spindle. I will leave it up to you as to whether or not it was a success. Needless to say the customer was pleased with the finished job. My only problem was that his cheque bounced and so I have spent several weeks chasing him for the cash, just one more of the joys of being in business! My regular upholsterer client came back to me last month with a request for a set of four walnut legs to match his customer's old chairs that he was replacing. I would guess his customer was keeping the original chairs as the only indication of what exactly I was to make came in the form of a photograph of the original leg, next to a tape measure and a list of dimensions. After studying the photo and deciding that it was a rather busy design I decided that there was scope in this case for a little 'artistic licence'. I would guess that if several turners were given the same photo each would interpret it a little differently and produce a slightly different leg, so I chose to interpret it in such a way that, to me at least, the parts of the design worked well together and, importantly, it was relatively easy for me to replicate. They were finished with button polish - a type of French polish - and sent off to my customer. Several days later he sent me a photo of the legs built into the chair frame with a thank you, saying that he was very pleased with them and he was sure his customer would be too.